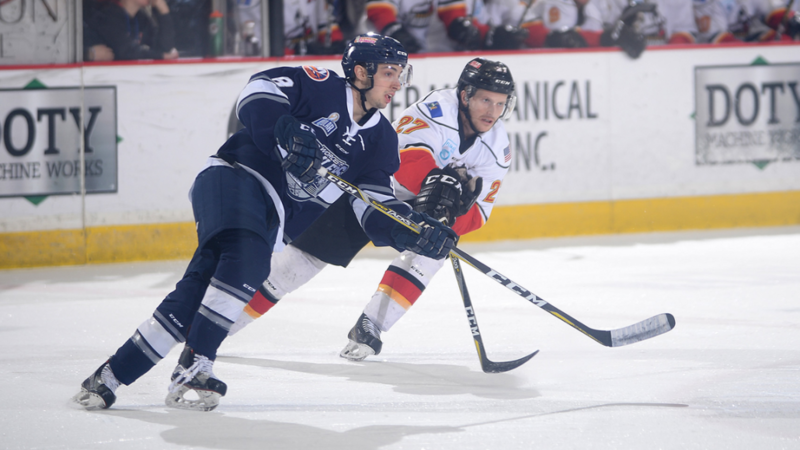 Glens Falls, NY – The Worcester Railers HC(0-1) made their Kelly Cup playoff debut with a 3-0 loss in Game 1 of the North Division Semifinals over the host Adirondack Thunder(1-0) in front of 3,540 fans at the Cool Insuring Arena on Friday evening. The series shifts to the DCU Center in Worcester for Games 2 and 3 on Saturday at 7pm and Sunday at 5pm. The Thunder scored in all three periods and MacKenzie Blackwood made 27 saves for the shutout win as Worcester outshot Adirondack 27-21. Mitch Gillam made 18 saves in his first professional playoff game in a feisty affair that saw 17 penalties whistled throughout the game. A hard hitting first period saw the Thunder score the only goal to take a 1-0 lead through 20 minutes. Tim Harrison (1st) deflected a shot from the point by Dylan Olsen that fluttered past Mitch Gillam at 8:58. Shots were 8-5 in favor of the Railers after the first period as MacKenzie Blackwood made a few nice stops on Matt Lane and Jeff Kubiak. The Thunder built on their lead as Paul Rodrigues (1st) struck on the power play from 25 feet with a quick snap shot through a screen at 7:54 of the second period. Shots were 11-9 in favor of Worcester in the second period as the physical play picked up another notch. Brian Ward (1st) banked a shot off Mitch Gillam from a tough angle at 5:50 of the third period to put the Thunder ahead 3-0. The third period saw nine penalties doled out which included a fight between Yanick Turcotte and Brian Ward at 18:50. Mackenzie Blackwood made seven more saves in net for a 27 save shutout as the Thunder took Game 1 by the score of 3-0. Notes: Three Stars: 3rd star: Paul Rodrigues (Goal) 2nd star: Tim Harrison (GWG) 1st star: Mackenzie Blackwood (27 saves, Win) …Final shots were 27-21 in favor of Worcester…Mackenzie Blackwood (1-0-0-0) made 27 saves on 27 shots for Adirondack… Olivier Mantha was the backup for the Thunder…. Mitch Gillam (0-1-0-0) made 18 saves in 21 shot in net for Worcester in his first professional playoff game…Eamon McAdam was the backup goaltender for the Railers…. Worcester went 0-for-7 on the power play while Adirondack went 1-for-7…Chris Langkow (inj), Jake Randolph, and Connor Doherty did not dress for Worcester…. Kellen Jones, Patrick Cullity, and Josh Holmstrom, and are currently on recall with the Bridgeport Sound Tigers…. Worcester went 5-1-1-0 at the Cool Insuring Arena during the regular season and 8-2-2-0 overall vs. the Thunder….13 players played their first professional playoff game… Barry Almeida and TJ Syner won the Kelly Cup with the Reading Royals in 2013….Nick Saracino and Jeff Kubiak each had five shots on goal. What’s on tap? – PLAYOFFS! The first 1,000 fans at all home playoff games will receive a Railers HC rally towel presented by Energy Monster and a BOGO offer coupon from Chipotle. Fans can score $5 Bud Lightsin the Bud Light Lounge at all home playoff games. Family Fun Packswill be available for all home playoff games which include four tickets, four hot dogs, and four sodas for just $80. Individual tickets start at just $15. Call 508-365-1750 or visit www.RailersHC.com. Tickets are on sale now through the DCU Center Box Office, online via ticketmaster.com, or by calling 508-365-1750. Worcester Railers HC members may purchase their season tickets for the playoffs by clicking HERE. The Worcester Railers were 16 points behind the Wheeling Nailers on January 25 and were in 6thplace in the North Division. The Railers have posted a 22-8-1-2 record since, which included a 15-3-1-0 record at the DCU Center. Worcester was 11-2-1 in their last 14 games overall outscoring their opponents 34-20. The Railers went 8-2-2-0 vs. the Adirondack Thunder this season which includes a 5-1-1-0 record at the Cool Insuring Arena. The Railers Tavern, located behind the DCU Center provides hockey fans with a great pregame and postgame atmosphere all season long. Watch all road games broadcast live at Railers Tavern or watch on ECHLTV.com for a small fee. Listen to all Worcester Railers playoff games live on 98.9 Nash ICON with coverage beginning 30 minutes before puck drop with Eric Lindquist and Tom Matthews. Full season memberships for the 2018-19 season, mini plans, and group tickets are on sale now by calling the Railers front office at 508-365-1750 or by visiting www.RailersHC.com.